Weathernews and LG Telecom Develop Weather Service for (South) Korea – Weathernews Inc.
Weathernews Inc. (Tokyo, Japan – CEO: Chihito Kusabiraki) has reached an agreement with South Korean mobile telecommunications provider LG U+ (formerly "LG Telecom") that aims to develop new weather-based content services for mobile phone users in Korea. 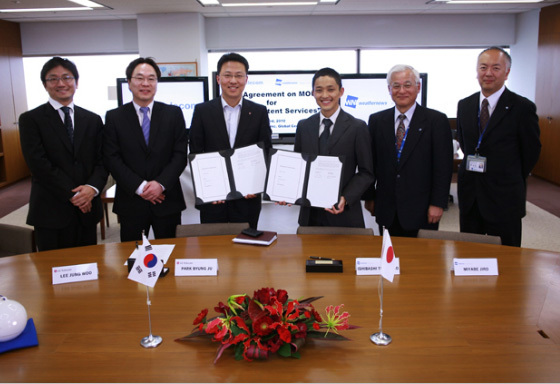 A signing ceremony commemorating the agreement was held today at Weathernews Global Center in Chiba, Japan. The new service will take the form of a joint-venture using the marketing power of both companies to create content that goes beyond standard weather forecasts, and develop a convenient service that has a directly positive effect on people's daily activities. This service will incorporate new observation sensors in the long term. However the initial goal for this year is to begin service for mobile content users in South Korea. Without being limited to providing content for users in Korea, the LG Group has plans to develop its communications network on a global scale. Park Hyung Ju, head of LG Telecom's Development Team, made the following comment at the signing ceremony: "Both companies have excellent planners and developers whose special expertise will be applied to not just weather-based contents, but to continuously developing and refining special services for all types of lifestyles with competitive power. I want both companies working together as partners to provide the very best contents which will be beneficial to people all over the world." Weathernews Board Member Tomohiro Ishibashi said, "If we put LG's Network Service and Weathernews Content together, we should be able to support new kind of lifestyle for people. We want the weather-based content we develop for our supporters in South Korea to be useful not only to them, but to also be useful for people across the world." LG Telecom is a Korean mobile service provider based in Seoul. In 1996, they were the first company to establish and commercialize the CDMA network. In 2010, the company merged with Powercom and DACOM to become LG U+. As of 2009, the company's sales reached 8 trillion won with 8,660,000 mobile subscribers.